We can quickly provide estimates thru virtually all online plan distribution services. These include but are not limited to Isqft, Smartbid, Bluebook, Thomas Reprographics, and most private systems. Physical plan arrangements and on location estimates are also part of our service. See “contact us” for your specific needs. Ceramic, porcelain, glass, and stone tiles are a typical project. These are normally found in the specification sections around 09300, but stone tiles are sometimes located in the masonry or stone panels sections. We provide a complete installation package depending on your requirements. 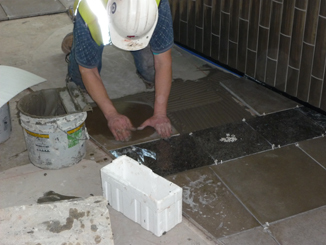 Examples of our skills would include floor preparation, waterproofing, anti-fracture membrane, standard and epoxy grouts, caulking, and various types of sealers. We can also provide slab stone countertop, stairways, and similar slab style installations if needed to complete your package. A typical warranty is one year but extended warranties can be obtained depending on the method and manufacturer selected for your installation. Please visit “Portfolio” for a better understanding how we can service your project.